Sorry, this giveaway has ended. 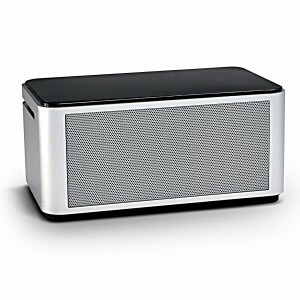 Congratulations to Anthony S. who won one (1) Orei Diamond Bluetooth 4.0 Enhanced Bass NFC Wireless Speaker. Connect with OREI on Facebook, Twitter, Youtube and Google+. Bluetooth speakers are portable, compact, lightweight and let you enjoy your favorite music anywhere, anytime. This is why they are so popular these days. This month, we’ve teamed up with Orei, a premier manufacturer of high quality audio/video products to offer one lucky tech-lover a chance to win a Diamond Bluetooth 4.0 Enhanced Bass NFC Wireless Speaker, courtesy of Orei, in the SweepstakesLovers.com Diamond Wireless Bluetooth 4.0 Speaker Giveaway! Entering is as easy! We want to know why you’d like to win this Bluetooth speaker so let us know by leaving a comment at the bottom of this page and be entered into the Giveaway for that day. Be sure to come back every day in May to improve your chances of winning! Plus, earn additional entries by following Orei on social medias! The SweepstakesLovers.com Diamond Wireless Bluetooth 4.0 Speaker Giveaway presented by OREI (the “Promotion”) is open to legal residents of the fifty (50) United States and the District of Columbia who are 18 years of age or older at the time of entry. Void outside the 50 United States and the District of Columbia. Also void where prohibited or restricted by law, rule or regulation. All applicable federal, state and local laws and regulations apply. The SweepstakesLovers.com Diamond Wireless Bluetooth 4.0 Speaker Giveaway presented by OREI begins at 12:01:00 AM Eastern Time (“ET”) on Friday, May 1, 2015 and ends at 11:59:59 PM PT on Sunday, May 31, 2015 (“Promotion Period”). During the promotion period, tell us why you would like to win a OREI Diamond Speaker by leaving a comment at the bottom of this page. 1) Like OREI on Facebook to receive one (1) bonus entry. 2) Follow @OREI on Twitter to receive one (1) bonus entry. 3) Subscribe to OREI’s Youtube Channel to receive one (1) bonus entry. 4) Follow OREI on Google+ to receive one (1) bonus entry. One (1) Grand Prize Winner will receive one (1) Orei Diamond Bluetooth 4.0 Enhanced Bass NFC Wireless Speaker. Approximate Retail Value of the prize is $59.99. The Orei Diamond speakers are wireless speakers that come with Bluetooth 4.0. It has a battery life of 8-10 hours after a full recharge. It is NFC enabled for one touch pairing. The device is very compact with a light weight of 10.1 ounce. The bluetooth range is up to 20 meters. When it comes to bluetooth speakers, I’m used to hear about top brands like Bose, Braven, Sony, and Logitech. Last month, when Orei, a company that I honestly never heard of, sent me their portable Bluetooth speaker to review, I was not expecting anything special. Wow, I was so wrong!! Can someone explain me why I never heard of the Orei Diamond Bluetooth Speaker before? When unboxing the Orei Diamond speaker, you’ll find the speaker itself, a 3.5mm Audio Cable, a USB Cable and User’s Guide. Unfortunately, there’s no AC Adapter included. If you own an Apple device and want a speaker that match its look, you should definitely consider this speaker. Its aluminum body and Touch Panel Control make it really compelling. You can pair the Diamond Speaker with an audio device in two ways: Bluetooth or NFC (which stand for Near Field Communication). To pair your audio device (smartphone, tablet) using the Bluetooth 4.0 connection, you’ll have to go through a few steps to connect it to the speaker. To pair it via NFC, which is also using Bluetooth, you’ll only have to activate the NFC function on your device and either touch or bring your device as close as possible to the speaker itself to connect. While the Bluetooth connection allows you to move your audio device up to 10 meters (30 feet) away from the speaker, the NFC technology requires you leave your device as close as possible to the speaker itself. This means that you won’t be able to move your device away from the speaker. When using the Bluetooth connection, I experienced some drop connections at around 20 feet in both vertical and horizontal ways, which in my opinion, is good enough. Alternatively, you may also using the included 3.5mm Stereo Cable to connect any audio device for direct play. The Dual Speakers provide crystal clear sound quality and as a bass lover, I must admit that I was surprised by the enhanced bass. You can literally feel the bass! Very impressive for such a small 6W speaker. And don’t be shy, this speaker can easy handle loud music with not that much of distortion. As per the product details, the built-in Li-Ion Rechargeable Battery offers between 8-10 hours of battery life and yes, this is true. I was able to listen to non-stop music from morning to evening with a single charge. As long as you recharge the battery over the night, you’ll be able to enjoy your favorite music all day long! You won’t have to break the bank to buy the Orei Diamond Speaker as it costs only $59,99 on Amazon. For that price, you get a nice modern looking speaker, good connectivity options (including the NFC feature), deep and rich sound, good battery life and more! Some might think the Orei Diamond Speaker is pricey. But when you compare to other top brands bluetooth speakers, it’s not that expensive considering all the features and sound quality of this speaker. Recommended! On or about June 1, 2015, we will randomly select one (1) potential winner and will announce the winner here on or around Friday, June 5, 2015. This giveaway is sponsored by OREI. Connect with OREI on Facebook, Twitter, Youtube and Google+. Disclosure: OREI provided me with a OREI Diamond Speaker free of charge for my review. I have not received any monitory compensation in return for the review. All opinions are 100% my own. OREI is providing the prize to the winner. I think the Orei would be a great enhancement to not just mine,but to anyones stereo component.I believe anyone that listens to this speaker system would enjoy the high quality of sound that is produced by the Orei sound producer.Once you try this,I no you will enjoy it! I want to win the speaker because I need the music I play on my phone to be louder while I’m dancing. I would like win this wonderful device to fill my home with the quality ‘sound of music’. It would be great when there are gatherings for entertaining the guest on the outside, as well as the inside. Looks like a great bluetooth speaker! I would love to have one to use during the pool parties this summer! I would love to win a bluetooth speaker to put in my livingroom. This would be great for my son so he can listen to his music and actually hear it. I think I could really use this lil feller ! I’d like to win this so I can play music for my 85 year old father who has Alzheimer’s. Studies show that playing music that is familiar to Alzheimer’s patients can potentially unlock long forgotten memories and I want that for my dad. I would love to win this ,because my computer speaker I cannot hear anything hope win !!!!!!!!!!!!!! I would love to win this speaker my computer speaker I cannot hear anything I really this speaker so I can watch movies hope I win !!! !